Prior to joining Goldberg, Miller & Rubin, Samantha was an associate at a general law practice in lower Manhattan, representing clients in various civil and criminal matters. Samantha has represented clients in the civil and criminal courts throughout New York and New Jersey as well as in the Southern and Eastern Districts of New York. She also has experience appearing before the Office of Administrative Trials and Hearings, the Executive Office for Immigration Review and the New York State Department of Labor. Samantha uses her diverse knowledge and experiences to provide the most competent representation for her clients. 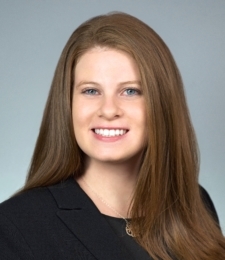 Samantha’s talent was recognized by the Thomson Reuters search committee when he was selected as a 2018 Rising Star, which is a designation provided to only 2.5% of lawyers who are under forty or who have practiced for less than ten years. Samantha earned her Juris Doctor from New York Law School and was a recipient of the Faculty Scholarship Award. While in law school Samantha worked for several insurance defense and personal injury law firms. When she is not practicing law, Samantha enjoys spending time with her family and friends.